Find out how to enter the Speed Trials in your car here. Find out how to enter the Speed Trials on your motorbike here. (Note: Our club do not handle the motorbike entries; this link will take you to the website of the Vintage Motorcycle Club. Any questions about entering your motorbike must go to them). If you wish to take photographs from the 'start box' then you will need to send a written request to the club on headed paper. Our address is in the 'Contact' section on the menu above. The Frosts Brighton Speed Trials is an exhilarating, action-packed day for spectators and participants alike. 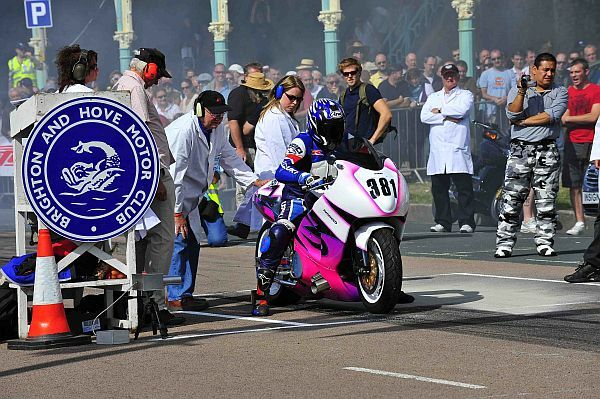 Over two hundred cars and motor bikes line up to take a timed run down Madeira Drive reaching high speeds. There are numerous categories including road cars, race cars and bikes who compete to win the fastest in their class. A top six run-off to find the fastest car and bike brings the day to a dramatic close. Thousands of people attend this fun day out for all the family, held annually on a Saturday in early September. Spectators watch close to the action on Madeira Drive or from the main road above. The Speed Trials starts early. As a competitor I turn up around 7am as there is lots to do before we get going; signing on, fitting timing strut, etc. If you are a competitor with a trailer then please do turn up early. You need to get unloaded and your car into its rightful place, and then your tow car and trailer must be left up the end of Madeira Drive in the car park, sealed off until the end of the day. As you can imagine, 50 people doing this makes for a complete shambles, hence turning up early! You can now buy tickets for the Speed Trials before the event, and you save 20% by doing so! Go here to buy tickets in advance for £12 (instead of the normal £15 on the day). From the very top balcony overlooking Madeira Drive you can just about see whats going on, but its not ideal. £15 (or £12 in advance) gets you into the paddock, and includes a free event programme. I'd highly recommend this; being able to walk around the paddock and see all the amazing machinery is something special, and is not always possible at events like these. You are missing out if you visit and do not get this close to the action. The middle balcony has been closed for a few years now, and hopefully will be fixed soon. Due to the middle balcony being closed, we now have a large video screen (21 square metres) in the paddock to better see the action. Kids under 14 (accompanied by a paying adult) get in for free! 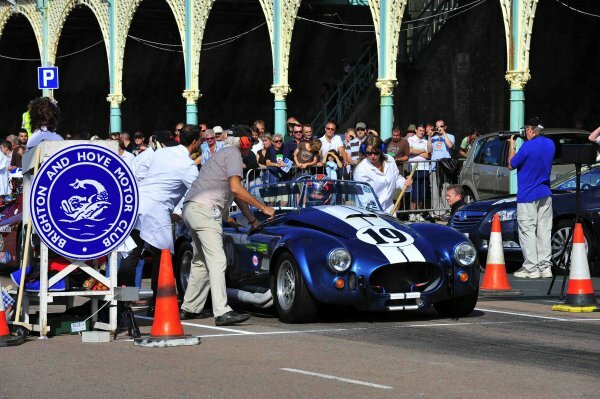 Finding the Speed Trials is easy; it runs along Madeira Drive, and Madeira Drive starts at Brighton Pier. Looking at the front entrance of the Pier, Madeira Drive is on the left and stretches all the way to Black Rock and Brighton Marina. Finding the pier is also easy; its at the end of the main London Road which runs straight through the town from north to south. If you are coming south on the M23 that becomes the A23 and that becomes the London Road; you simply take no turnings off that road and you'll find yourself at the pier. From the A27 take the turn-off for the A23 and just follow it into the town, as above. Parking requires a bit of planning. While there is a lot of on-street parking around the area, easily catered for with nearby machines that take cash or cards, most are limited to two hours, which simply isn't long enough. They will also be very busy, it being a Saturday. As opposed to driving round and round looking for a space, then having to remember to return every two hours, I suggest putting your car in an NCP or similar, and then you don't have to worry. Yes, the daily price will be £15-20 but at least its done and you can carry on with enjoying your day without worrying about parking fines or the like. The nearest large NCP is West Street, under Churchill Square, the nearest shopping centre. There is a slightly closer, smaller one under the large glass-fronted hotel whose name escapes me. To find them, drive to the pier as you would to get to the Speed Trials themselves, then turn right instead and continue along the seafront. Turn right at the first set of lights for the smaller one, and at the 2nd for West Street. They are both signposted clearly. The walk back to the pier will take 5 minutes or so.